In recent times, the humble light bulb has seen some fairly impressive upgrades. No longer are we happy to have a light switch activate them. Now, we want to be able to switch them on remotely, via our smartphones or simply by yelling to Siri or Alexa to do their thing. Plus, who wants a light bulb that just offers one color when there are millions of combinations available? With a wide spectrum of different smart light bulbs available, it’s tough to know where to start when embarking on making your lighting brighter in more ways than one. We’ve taken a look at some of the most popular options and determined which will be best for your home setup. One of the most well known names in smart light bulb technology, Philips Hue is a pretty good all-rounder, barring one potential problem for those limited on space— it’s dependent on a smart hub to do the work. With a starter kit weighing in at about $70 for a hub and 2 white bulbs, it’s a reasonably mid-range option. The bulbs look the most like a regular bulb, compared to the competition, and setup is a breeze, typically only taking 10 minutes to get started. Requiring a hub means you’ll need to dedicate an electrical socket to it at all times, but that hub does mean Philips Hue offers the most compatibility with the widest range of smart home products. It’ll happily work with Amazon Echo, Apple’s HomeKit, Google’s Assistant, as well as devices such as Nest and apps like IFTTT. The bulb offers a light color temperature of 2,700K, providing the equivalence of a 60w bulb, with an average lifespan of 23 years. The Hue app makes it easy to dim the lights, as well as arrange routines, and timers. One of its best features, geofencing, ensures you can have the lights come on the moment you enter your home. As a general all-rounder, it’s an ideal setup, although bear in mind that things can get pricey as you’ll find yourself needing numerous additional bulbs to cover your home. 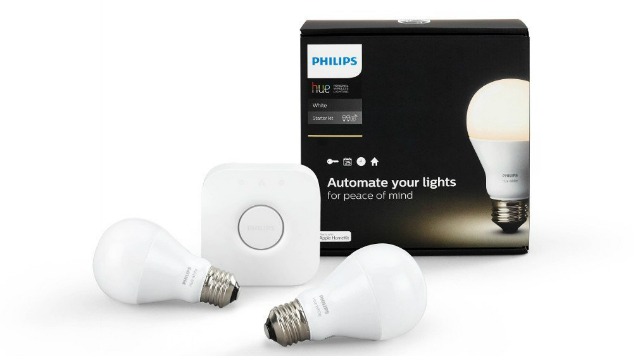 LifX is a lot like Philips Hue but with the advantage of not requiring an additional hub. Available in original and color forms, you simply hook up the bulb to your WiFi and you’re good to go. Setup is quick although I found some brief issues with switching it to a different router after I swapped routers. It works alongside all smartphones, Amazon Echo, services like IFTTT and Nest. There’s no Apple HomeKit support yet though, with possible plans of it coming soon. LifX offers the strongest light color temperature of all the smart light bulbs tested here, with between 2,500K and 9,000K available. The color bulb in particular is a delight, easily providing you with the richest colors of the bunch. With an average output equivalent of a 75w bulb, it’s pretty impressive stuff, and makes the initial outlay of about $50 or $60 for a bulb seem quite reasonable. One neat feature for LifX is its ability to connect to Nest Protect, with lights flashing if there’s a problem with carbon monoxide emissions in your home. There’s the usual dimming, scheduling, and geofencing options too, with themes and scenes easily arranged. Given the relatively hefty price for one bulb, LifX is going to be best if you have a small home or just want to experiment with one or two bulbs. If you’re only interested in having one room controlled by smart lighting, it’s a great way of enjoying a high end experience. If you’re thinking of covering the whole house, though, stick with something less pricey overall such as Phillips Hue. One of the newer names on the market, Koogeek’s smart bulb doesn’t require a hub, and it’s inexpensive at about $37. Despite being cheap, it’s not short of features. It offers support for over 16 million colors, like LifX, and it’s fully dimmable. There’s scheduling features, automation and the ability to set up scenes and timers. Weighing in at the equivalent of a 60w light bulb, it’s just the right power for the vast majority of homes. So, what’s the catch? It’s a fairly hefty one for many users— there’s no Android support. While Koogeek offers a Smart Plug that has Android support, the light bulb doesn’t right now. There’s also no way of controlling your light through Google Home or Amazon Echo. Your main options stem from Apple HomeKit and iOS devices. The support is great and the app very easy to use, but it’s an important limitation for those homes with Android devices. If you only have iOS devices at home, then Koogeek is an ideal cheap alternative to more popular names in the smart light bulb world. On an extreme budget but still want more than a regular light bulb? Consider TikTeck Smart Light Bulbs. Costing only $10, they’re in high demand given they’re the ideal introduction to the smart lighting world. They’re not quite as bright as LifX bulbs, but impressively they match the Hue’s abilities. Various lighting options are available, but don’t expect to be able to use geofencing or anything too fancy. Do, however, enjoy being able to set your lights to change according to the beat of music, and play a rudimentary Match-3 game that changes your lighting as you match. Gimmicky stuff aside, the main catch to TikTeck Smart Light Bulbs is that they aren’t accessible remotely. Bluetooth does everything rather than Wi-Fi meaning you have to be physically near to your lights. That means you can’t enjoy the pseudo security features of other smart light bulbs. On the other hand, they’re an ideal starter package for anyone who wants to see if smart lighting is really worth it for their home.